Brussels, Belgium -- The Tibetan spiritual leader, Dalai Lama, said Wednesday that he was only seeking autonomy for Tibet and not separation from China. But he demanded autonomy for Tibet to preserve an 'ancient culture and an anchoring of the Buddhist tradition'. 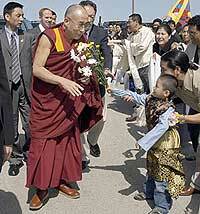 The Dalai Lama is currently on a week-long visit to Belgium to speak on Buddhist spiritual values. He stressed on the importance of religious harmony for the well-being of a society but also lamented the violence caused in the name of religion.